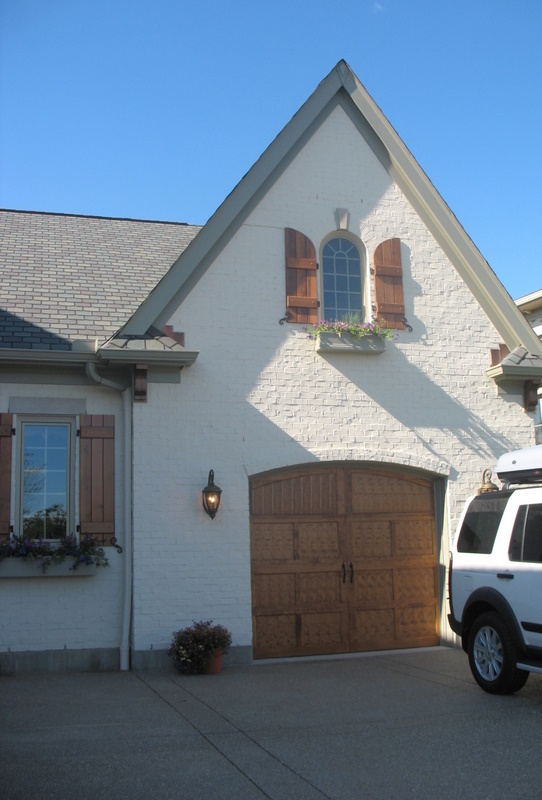 In case you haven’t heard, we’re touring seven of the homes from the Homearama Home Show in Cincinnati and voting on our favorites this week. The Manier Sherridan is a ranch-style house with 6,180 square feet that Hensley Homes has already sold for $1.8 million. 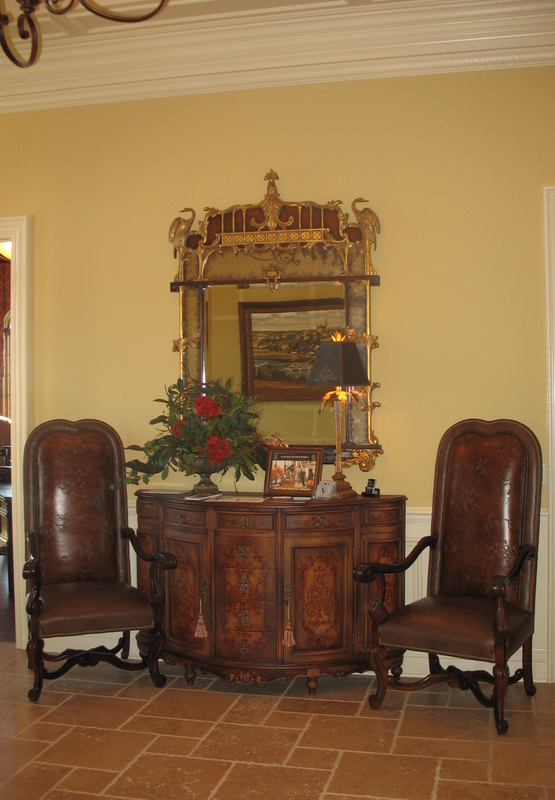 The study off the foyer. 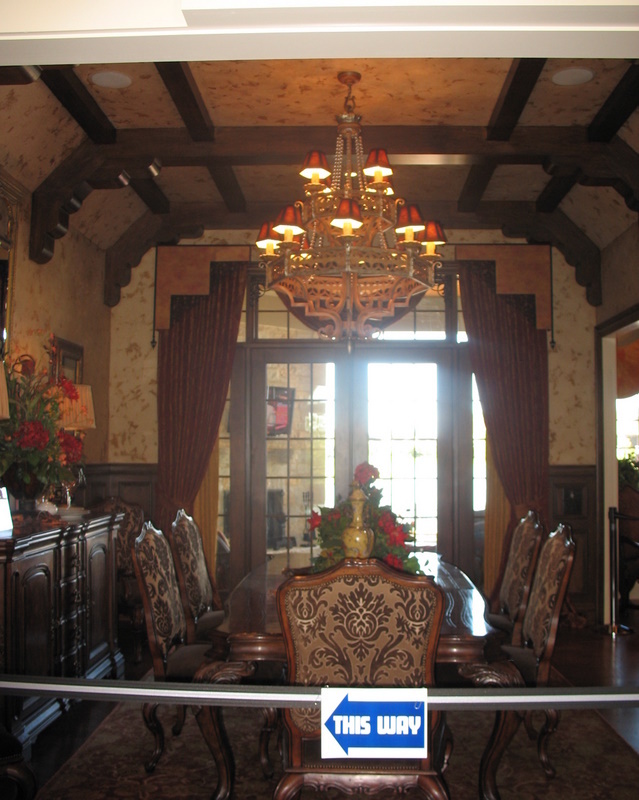 The dining room, which looked to me like it belonged in an old Hollywood home from the 1920s or ’30s. A view of the foyer ceiling. Fireplace and TV facing the bed in the master. 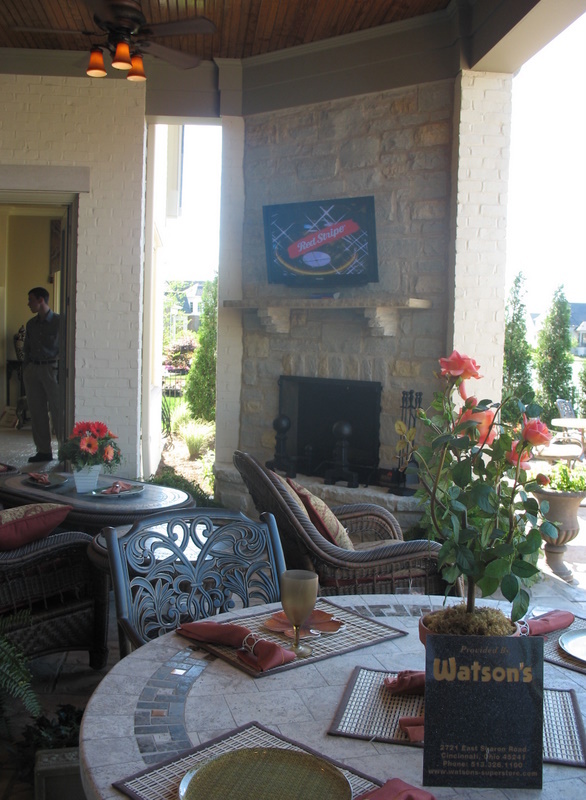 Step out of the master bedroom onto a covered porch that features a firelace and plenty of seating. I think this was the only house with a pool at Homearama this year (correct me if you went and remember another one!). The hearth room off the kitchen. The bar off the hearth room. The stairs to the lower level. 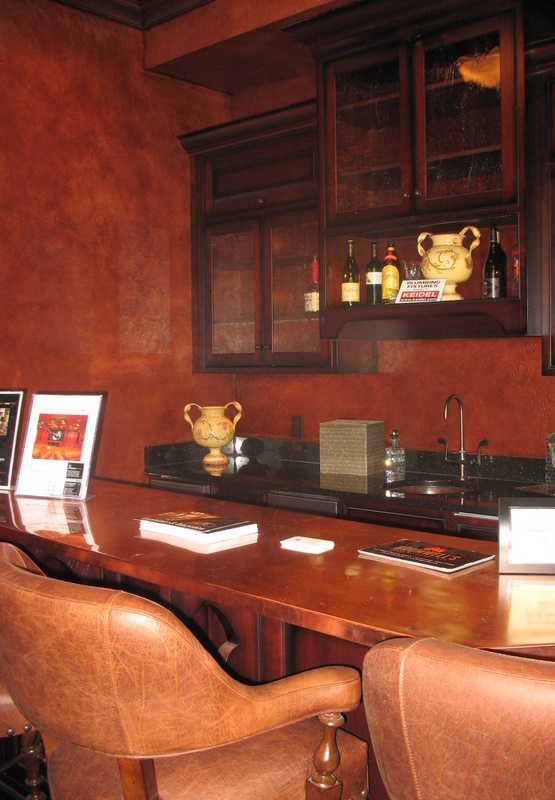 Another bar–this time in the lower level. 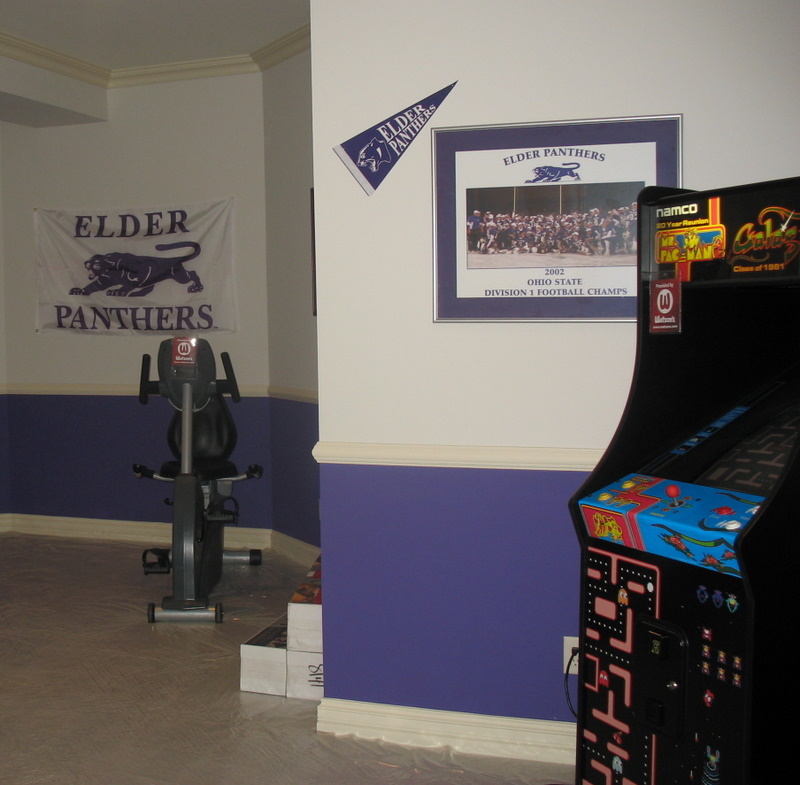 A “man’s room” in the lower level that shows school pride. 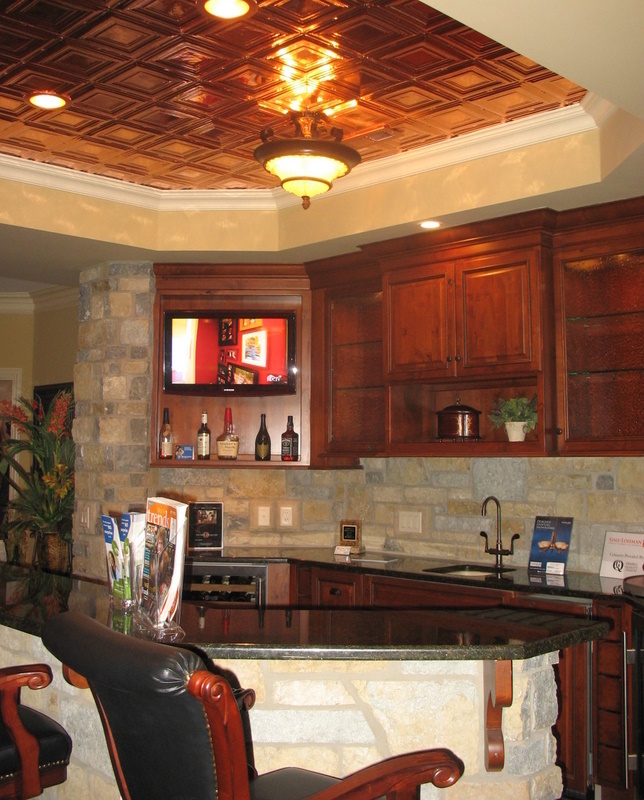 Close-up of the copper ceiling in the bar area. A fine room for Fido (see earlier post for more photos of this room for the pampered canine). Back door. I loved the shutters and flower boxes in the windows. 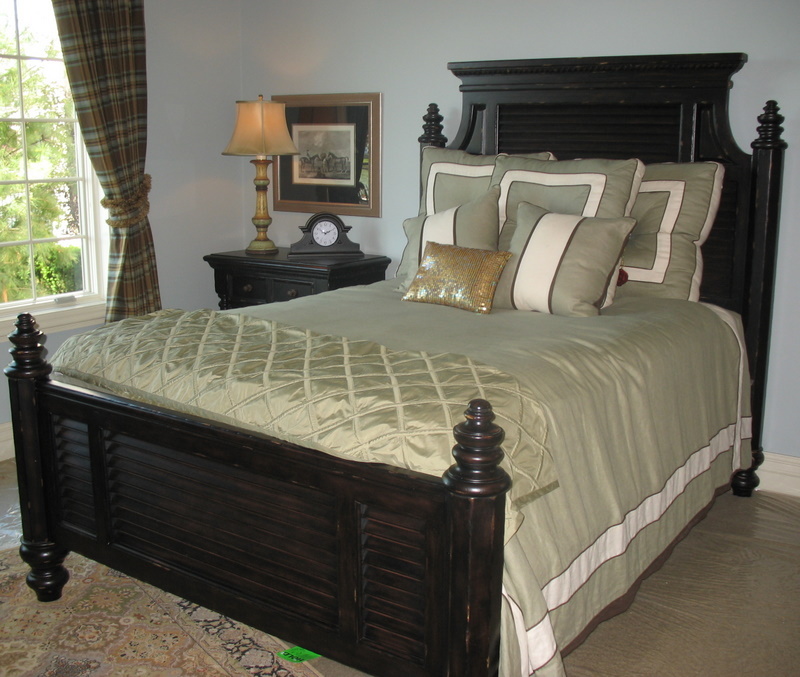 To see more photos of the one-of-a-kind dog suite, go to A Fine Room for Fido. It has everything a canine could possibly want or need! CLICK HERE TO VOTE AND SEE THE RESULTS SO FAR! 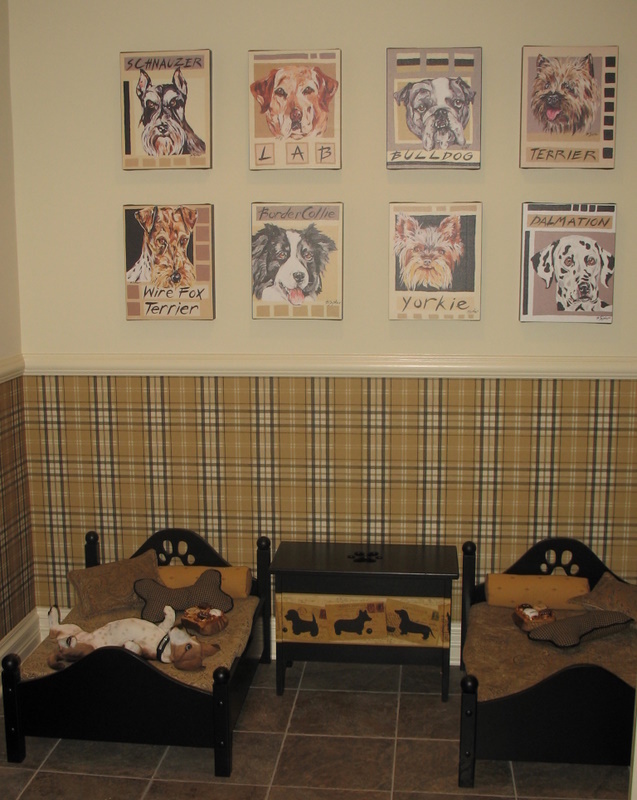 A Fine Room for Fido: It’s a Dog’s Life at Homearama! This one was definitely not my style. The study and dining room were way too dark for my taste. The only things that I really liked were the doggie room (I think it’s fun), the first floor guest room bed, the shutters and the window boxes. Walk away!! I liked the moldings and panelling and woodwork, though the furnishings and window treatments were a little too heavy and fancy for me. I would have ousted the cute doggie room, since I don’t have pets. And repainted the school pride room–there’s a “which of these rooms don’t belong?” exercise for you. 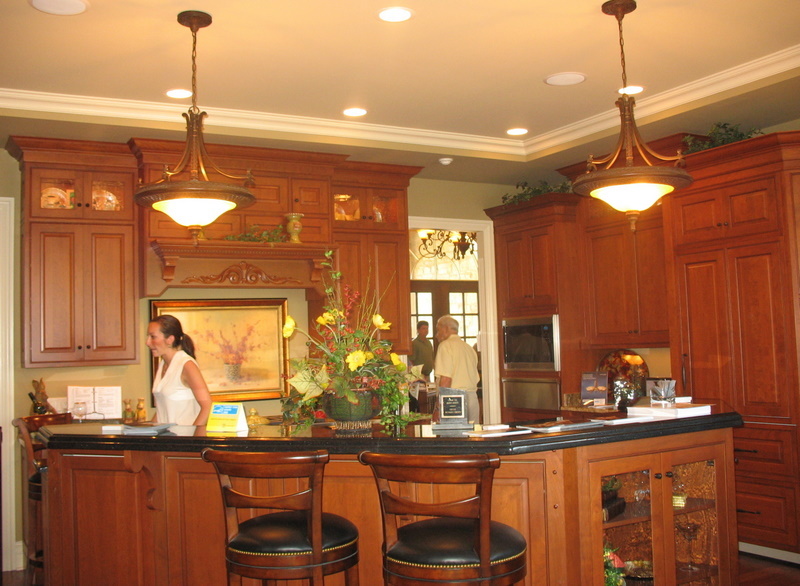 While I love all the millwork, I don’t think that I could actually live with all the dark wood. Living in FL most of my life, it’s just not something I’m used to. 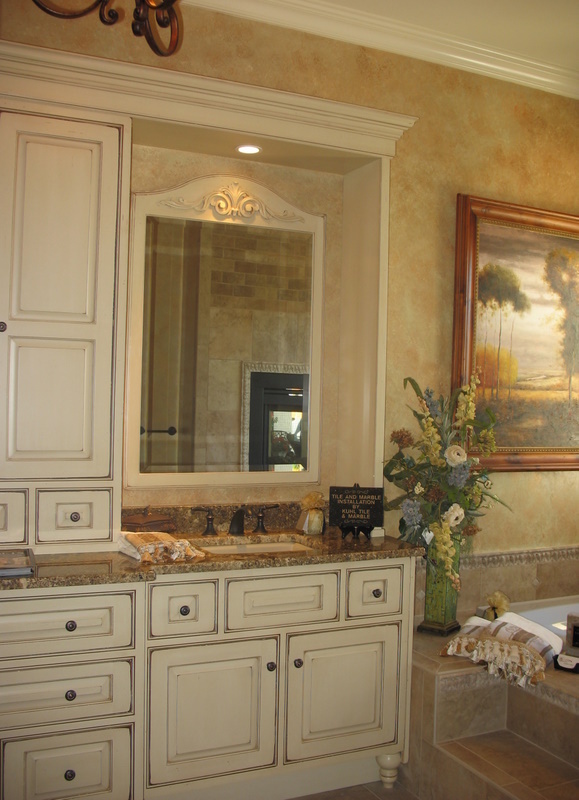 And that master bath sure seems chintzy compared to the rest of the house! It reminded me of Bavaria or Old World Charm. I agree that the dining room is too dark, but I did love the study off the foyer. I also loved the shutters. Way too dramatic for my taste. The furniture is heavy and overwrought and all those different wallcoverings give me a headache. The mammoth chandeliers are too much as well. 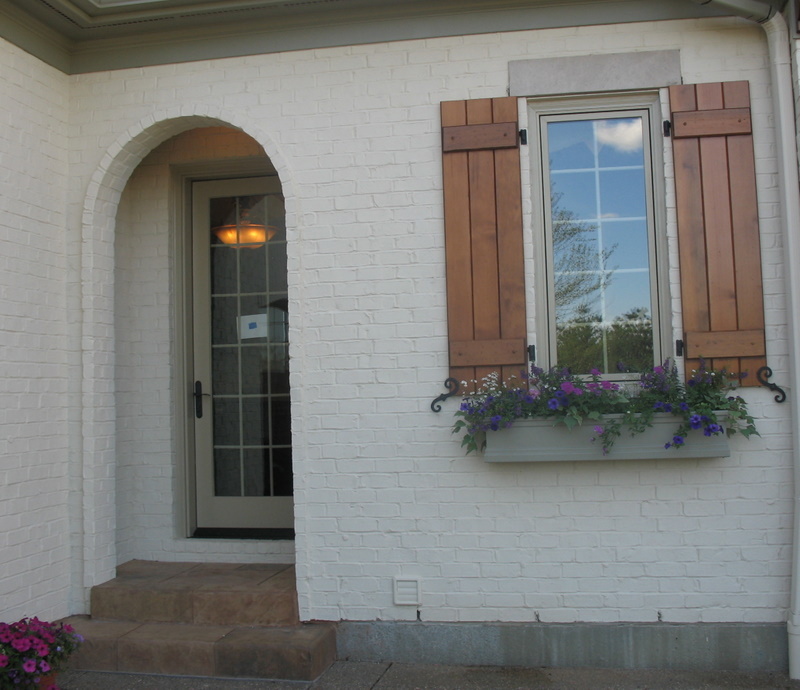 I do love the shutters and window boxes and you got a good shot of the water; the pool is nice. I don’t get the patio off the Master Bedroom. It looks like they expect company to sit out there. So would guests be cutting through the bedroom to use the bath or is it easy to walk around to get inside another way? In any event, I’ll be walking. I like how they decided to go with a very European style…they stuck with it and I think they did it well. That being said, for me personally it’s way too dark and ornate. But the exterior is lovely, as is the architecture itself. I liked the exterior of this home better than yesterday’s. But, there are several things in this one that are deal-breakers for me. 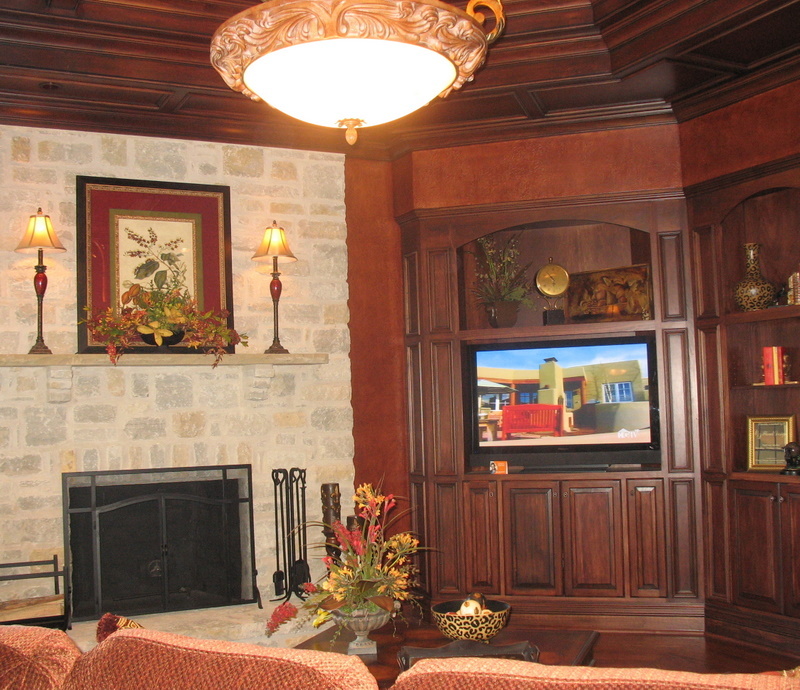 While I love millwork, the dark stained wood in some of the rooms was way to overpowering for me. I really prefer painted millwork. Also, the style isn’t much like me. I did enjoy the dog room, and the pool setting is lovely! 🙂 I walked away. I love this one! The “european” style is really appeals to me. 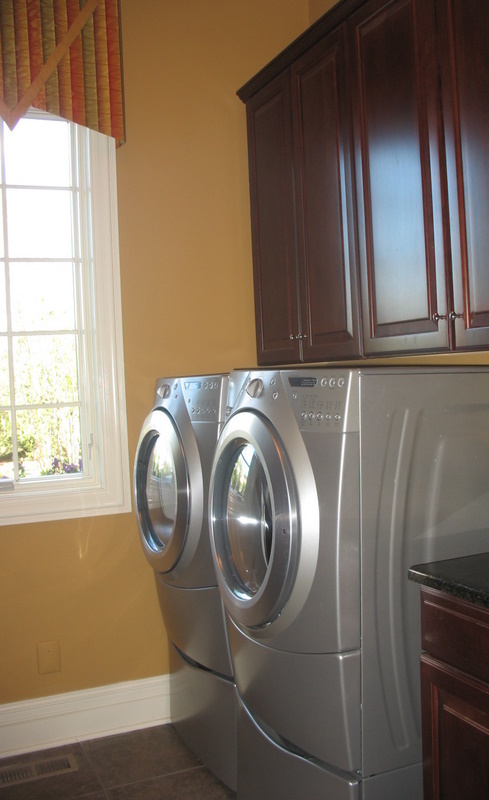 That red hutch in the laundry room is gorgeous! I love the outside of this home. It had me at the study and lost me on the staircase and then everything started looking like any new home in this price range. That staircase fits that house like a VW wagon would look in the garage of it…. Not right. 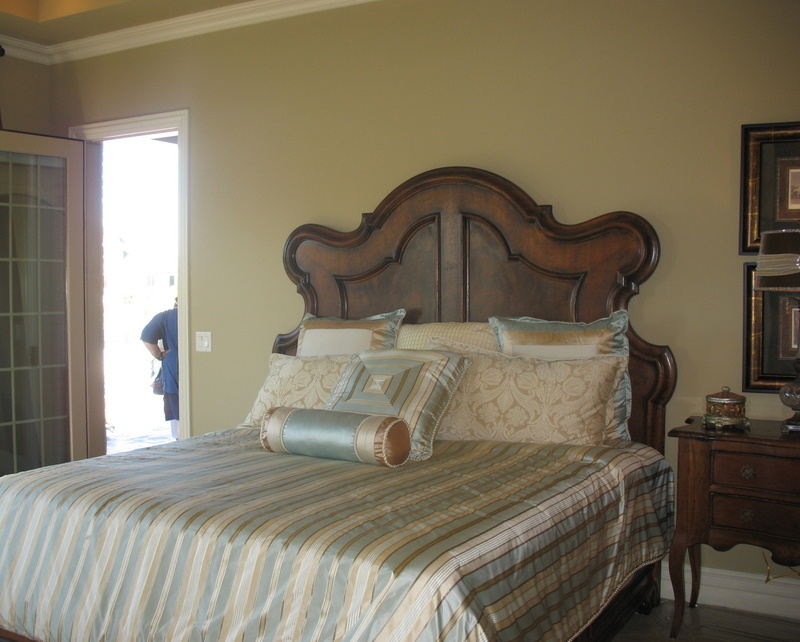 I loved the dining room, the laundry room, the guest room and the dog room. The fireplace in the master should have at least looked old, but was too modern for the house. I would sleep on it, but it would need a lot of work to suit my tastes. I’ll pass, but will take the washer & dryer ! 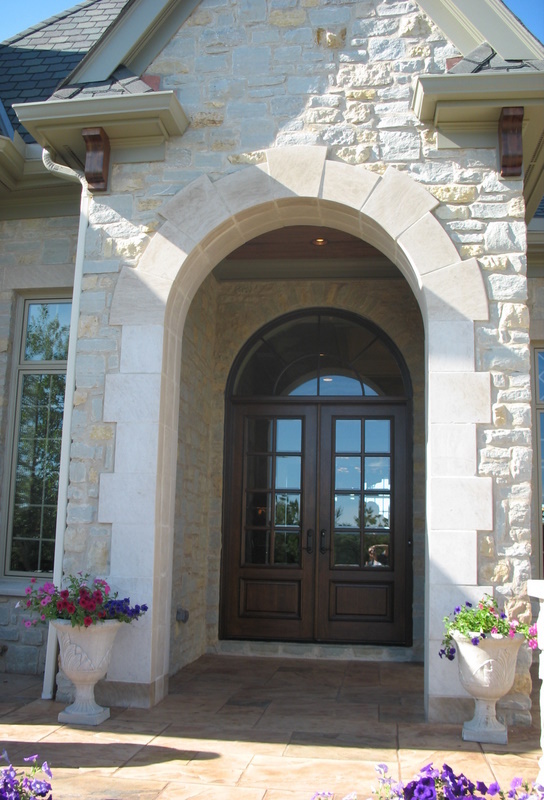 The outside of the home is beautiful. However, It is way too dark for me inside. Too much heavy furniture and dark woodwork. Wow, I was completely smitten by the first few pictures (particularly after the kinda blah previous house). I love all the wood in the ceilings and the library/study. The outside is cute too, which is rare in these huge new subdivisions. It lost me a bit, after that though. The kitchen and multiple bars and sitting rooms downstairs didn’t seem to flow well with the stone and painted wood and darker wood all going at once. Too much. I slept on it, and am thinking I should have walked away. It feels too heavy for me. No thanks. Fun – that dog area is crazy! 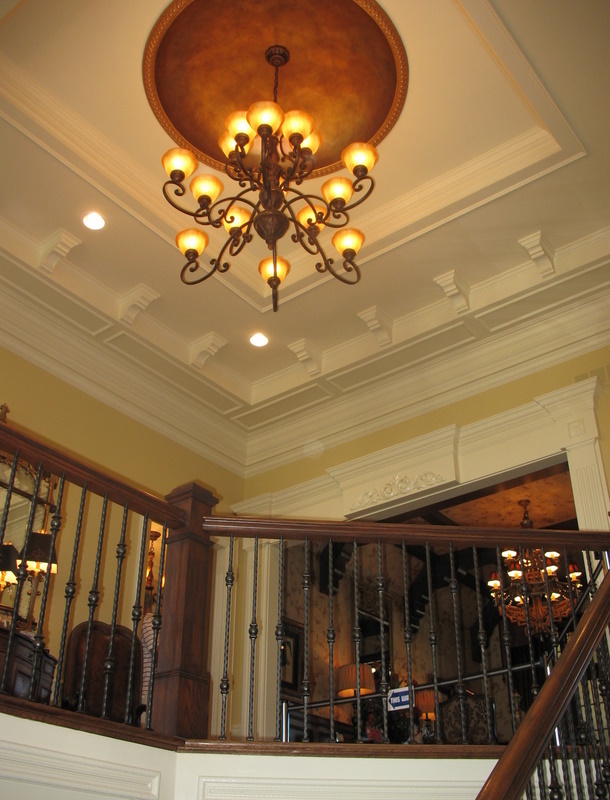 I like the foyer with the mix of medium walls, white trim and ceiling and the dark handrails. 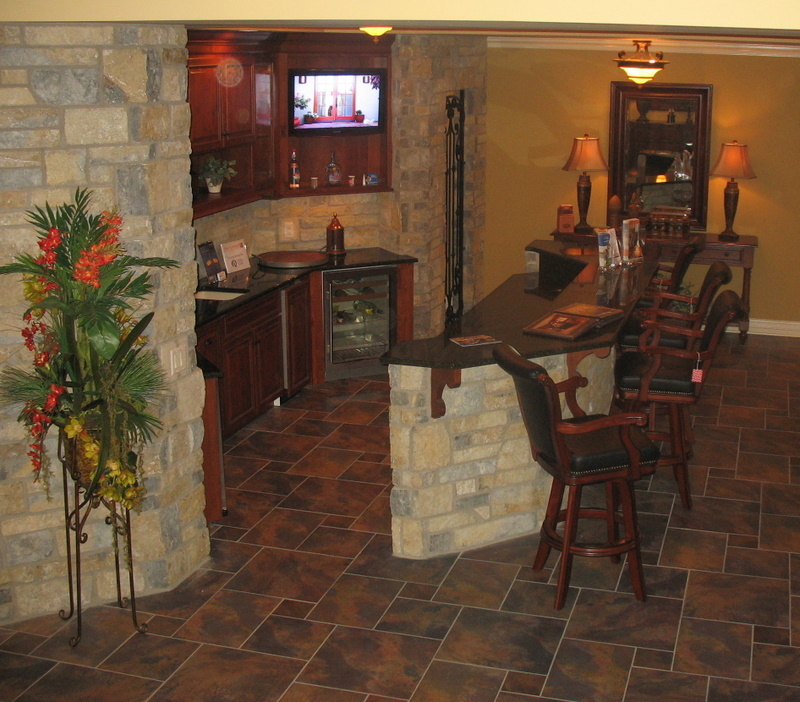 I like the stone outside but not sure if I like it in the kitchen. And all of the woodwork is a little dark for my taste. Hey Julia. I adore these house tours. I got my table and chairs several years ago, online at Pottery Barn. The table was on clearance, and the chairs were super cheap. Ok, let me rephrase, they were super cheap for Pottery Barn. In all I paid about what I would have at a local furniture store, so I was happy. I’m not sure if Pottery Barn carries these chair anymore, but I think K-Mart and Target used to carry bent wood chairs. It’s very dark and wallpaper-y (yes, I know that’s not a word). This home is beautiful, just way too dark for me. I voted to walk away. This is a ranch?!?!?!? Boy, ranches have changed. I love the study, the covered porch, the dog room and the laundry. 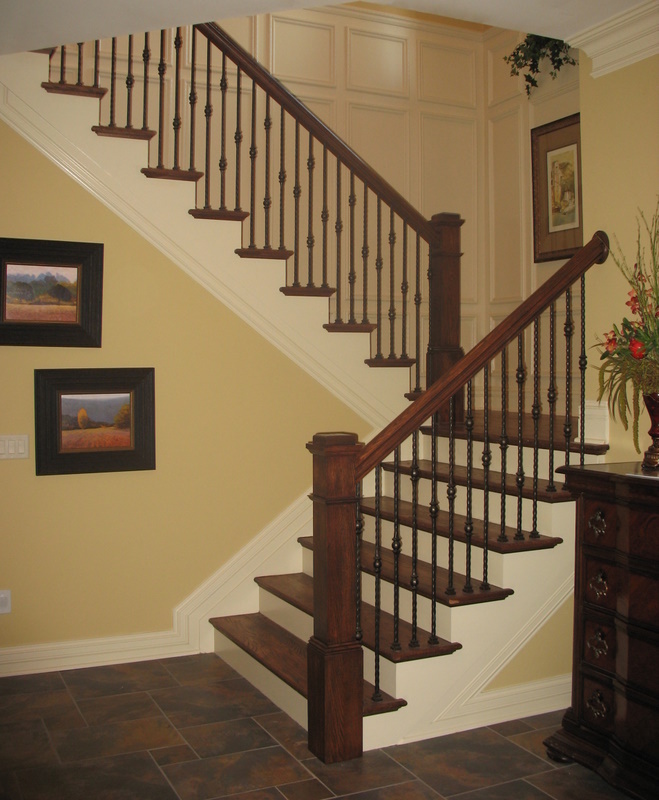 The stair banisters don’t seem right for the house. The garage door looks too small for that SUV. 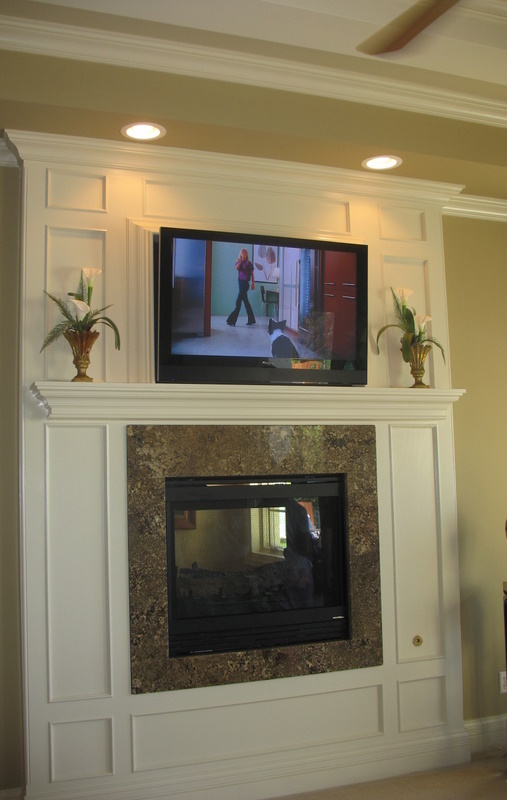 When I saw the TV over the fireplace, I could hear Kelly Ripa saying “Toss Jack his toy.” Ha ha. Nice architecture throughout, but these McMansions just don’t appeal to me. I’ll pass. 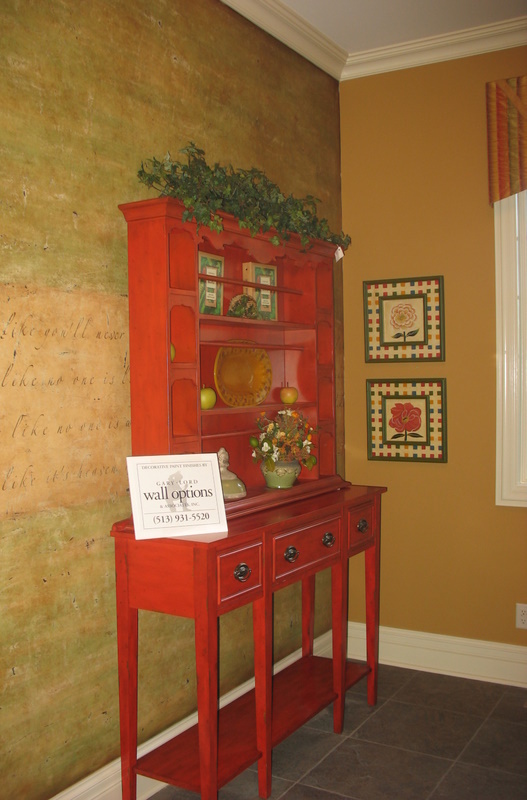 Many thanks to Christine for posting the paint colors!! I appreciate it. 1) The covered patio/porch in back also connects to the kitchen/hearth room areas, so it’s not like people would have to traipse through your bedroom to get there, LOL. 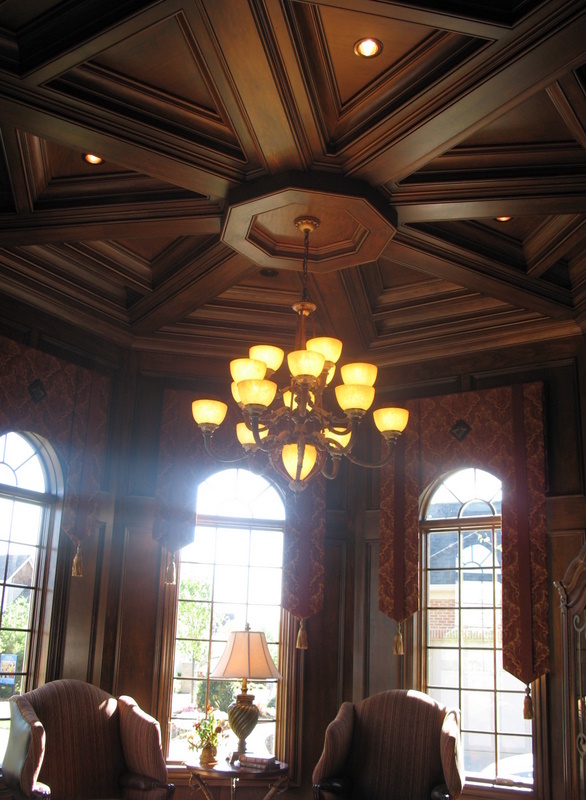 The study is my favorite room… the ceiling is beautiful. Window boxes are charming! Fun house to look at, reminds me so much of the Street of Dreams tours in Atlanta. I love to look at this, but honestly wouldn’t want to own a house that big. Just way too much square footage to ever use it properly. But, fun to look at and admire! A little dark for me , they need to pop something in each room to brighten it up. And an ELDER purple pit ??? It wasn’t kitschy enough to be fun. So dark! But I do love the exterior. I do love those shutters, too. I voted walk away. It was beautiful, yet heavy feeling. It felt like a museum or a historical house with all that wood and stone. I walked away. 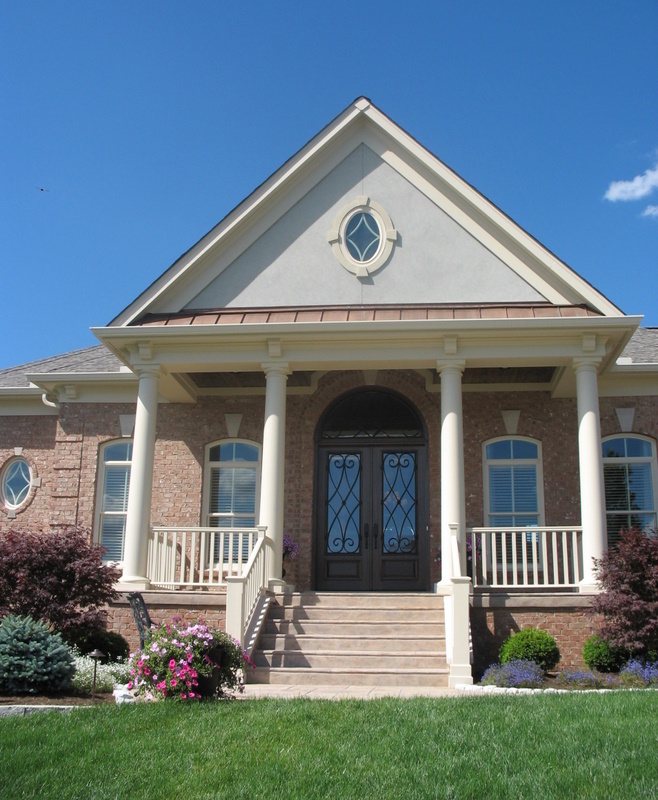 The exterior is really amazing with the shutters, pool, porch. Love those areas of the house! Love the exterior; the interior not so much. All of these homes are just so ornate or themed or possibly just ostentatious, that I can’t fall in love with them. Give me an older house with character anyday! great looking house! you make me want to move with all these houses! and I love my home… but you find wonderful places! I fell in love with the exterior – but the interior was more like the Dublin Castle where the monarchy lived,. It had none of the quaint charm or lfairy tale ightness of an irish country siide abode. 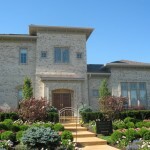 I’m making my way through Homearama and enjoying! I’m a tad behind on my visits, so will do the tour this morning. 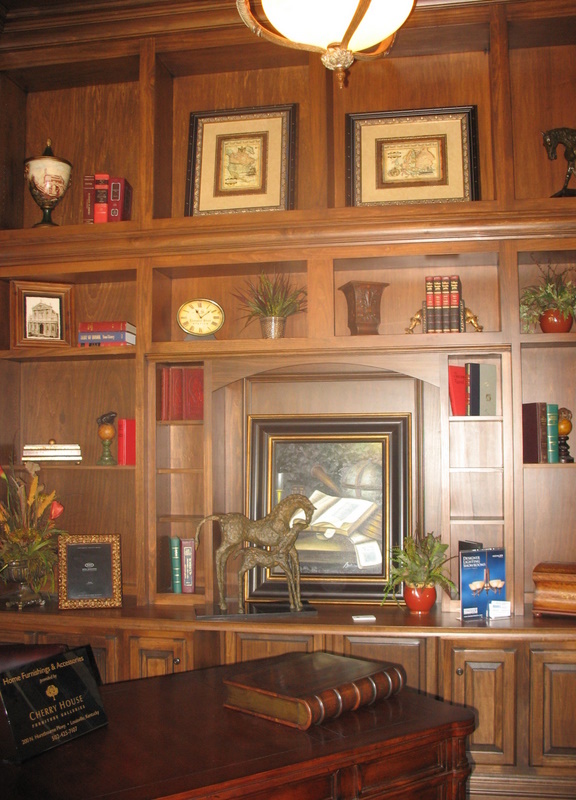 The study, in this home, is similar to the library of our neighbor across the subdivision. The homeowner, who is a real estate broker/developer (developed this subdivision from one of his farms), landowner, farmer, wheeler dealer etc…acquired a truckload of walnut at a fantastic bargain price and milled all the woodwork in their home, in his very own shop, just down the hill from us. Fortunately he is generous and has done a thing or two for us. Just little things, nothing as grand as their gorgeous library. I’m not very fond of the house at all. But I really do love the property. 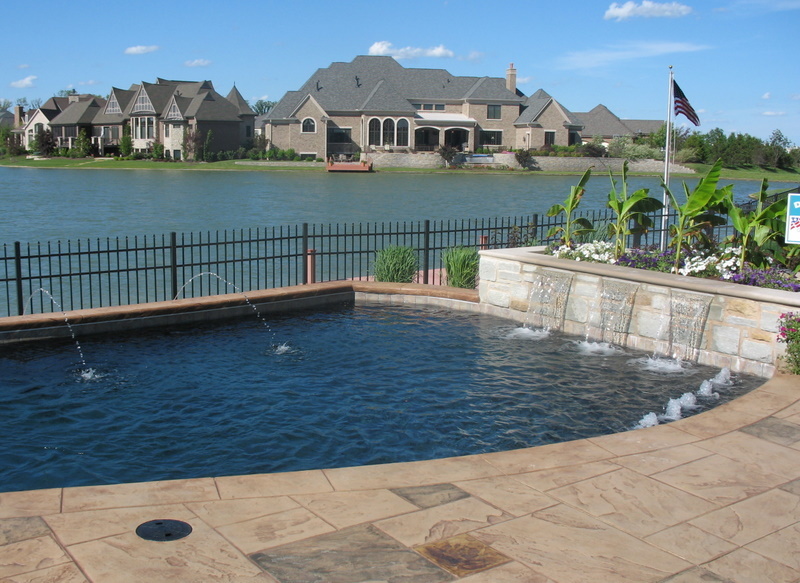 The backyard with pool on the water is just spectacular. I would love to be back there every day.